To elucidate the decomposition behaviors of lignin from different taxonomic groups, five different lignocellulosics were treated with hot-compressed water (230 °C/10 MPa/15 min) to fractionate lignins into water-soluble portions, precipitates, and insoluble residues. The lignin-derived products in each fraction were characterized and compared. 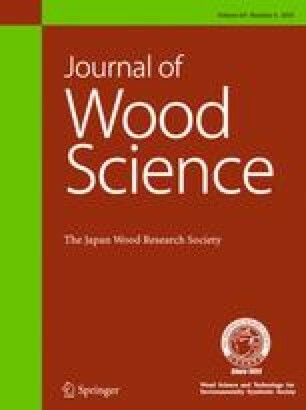 The delignification of monocotyledons [nipa palm (Nypa fruticans) frond, rice (Oryza sativa) straw, and corn (Zea mays) cob] was more extensive than that achieved for Japanese cedar (Cryptomeria japonica, gymnosperm) and Japanese beech (Fagus crenata, dicotyledon angiosperm). The water-soluble portions contained lignin monomers like coniferyl alcohol and phenolic acids, while the precipitates contained higher molecular weight lignin with high content of ether-type linkages. Lignin in the insoluble residues was rich in condensed-type structures. In all five lignocellulosics, ether-type linkages were preferentially cleaved, while condensed-type lignin showed resistance to hot-compressed water. In the monocotyledons, lignin–carbohydrate complexes were cleaved and gave lignins that had higher molecular weights than those eluted from the woods. These differences would facilitate the delignification in monocotyledons. Such information provides useful information for efficient utilization of various lignocellulosics. This work was supported by the Japan Science and Technology Agency (JST) under the Advanced Low Carbon Technology Research and Development Program (ALCA) and Kakenhi (no. 16J11212), a Grant-in-Aid for Japan Society for the Promotion of Science (JSPS) Fellow, for which the authors are grateful. The authors declare no conflicts of interests associated with this manuscript.